Almonds have been revered in many cultures since the beginning of time. This widely cultivated seed is native to the Middle East and South Asia, and is also a cousin to the peach fruit. “Wild” almonds differ from the “Sweet” almond variety, in that they are bitter and contain toxins (cyanide). All commercially grown almonds are of the sweet variety. The United States is the largest producer of (shell) almonds in the world. California’s 3rd top agricultural product is shelled almonds. Spain and Italy are two of the top five producers of almonds in the world. Spain has the most diverse cultivars of almonds in the world. The almond tree rapidly matures and produces a harvest crop in three years. The tree typically reaches full maturity by year six. The mature fruit is ready for harvest approximately seven months after flowering. The fruit, more accurately defined as a “drupe”, measures approximately 1-2 inches long having a thick leathery coating, or hull. Within the hull, is one seed, sometimes two, which is commonly referred to as the nut. The developing fruit resembles a peach until approaching maturity, then the leathery outer hull develops; eventually splitting open, and curling outward, and somewhat efficiently, discharging the nut. 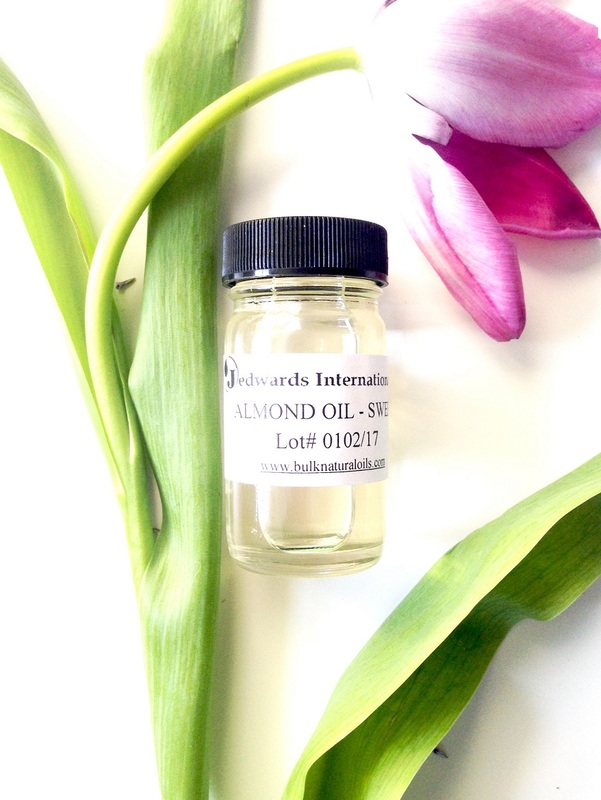 Jedwards International is a leading wholesale bulk supplier of sweet almond oil, sourcing its quality cold pressed oils from the United States, Spain and Italy. We also provide bulk virgin organic sweet almond oil. Almonds yield a rich percentage of oil upon “pressing” which is the traditional extraction process, with values as high as 60% of dry mass. This high liquid to dry weight mass ratio allow almonds to be efficiently processed into a milk substitute (almond milk), valued by lactose intolerant people and vegans. 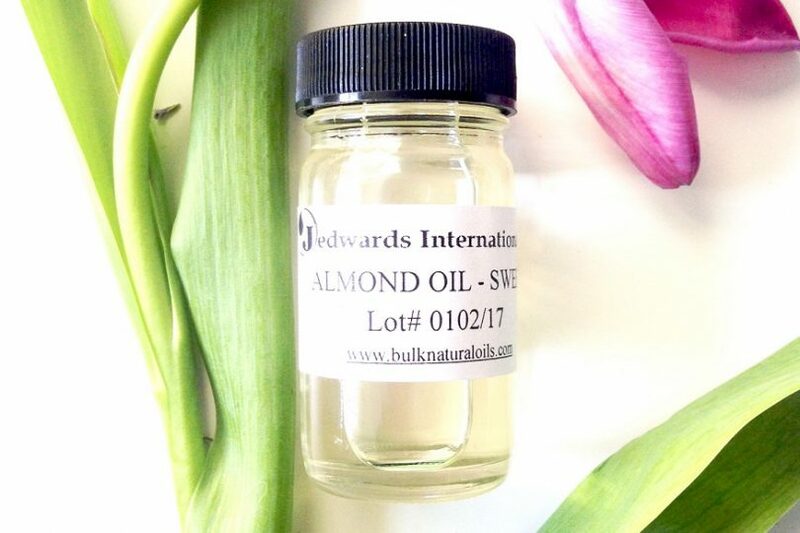 Jedwards” sweet almond oil is cold pressed preserving its full complement of Vitamin A, E, and B, and oleic acid, lineloic acid, and essential fatty acids. The refined oil is clear to light yellow, and is relatively stable when exposed to higher cooking temperatures, making it an excellent substitute of olive oil in stove top cooking. The oil is widely known in the massage therapy industry as a valued emollient, providing a soothing and hydrating affect on skin. Its sweet smell, vitamin compliment, and potential antioxidants provide an aromatherapy benefit, along with softening and nourishing qualities. Jedwards supplies bulk sweet almond oil and virgin organic sweet almond oil in 18 kg pails, gallons, and drums.